Hey, how about it? 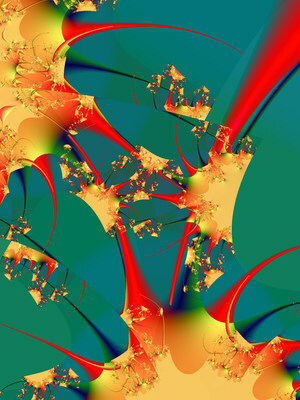 Is this the Campbell Soup Cans of fractals or what? Anyhow, Andy told me, and no one else knows this, that he’s taken all his talent and everything he’s ever learned about art and put it into a single photoshop filter. And he gave it to me, on a diskette. I’d post it for download, but I promised I wouldn’t, or else I’d lose all my super-powers. A long time ago when I was in university I wanted to learn Spanish because I was going to go to Mexico for two months in the summer. Being exceptionally lazy when it comes to learning languages, or anything else mathematical, I checked out, started to study, and gave up on, a number of Spanish grammars. I never finished reading the book about Andy Warhol. I don’t know what the reason was. A lot of people have altered their names to make them sound more or less of something. I’ll bet there’s even been someone with the last name Warhol who’s added an “a” and changed it to Warhola. 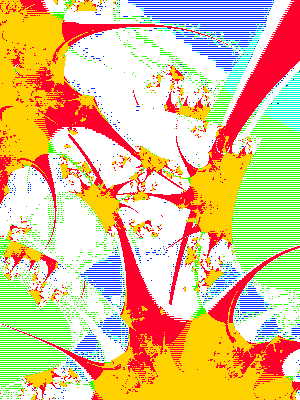 Here’s the original before “warholization” occurred, made in Inkblot Kaos. Which is better? The Warhol or the Warhola? Actually, the effect is just the uscomic.8bf thing with the darkness slider moved to the lighter end of the range, the image inverted and the hue moved about half way around the spectrum. But maybe that’s all Andy Warhol ever did when he made his famous stuff. Of course he would have had to do it the hard, old-fashioned way. You know, I’ll bet there’s a Lou Reed filter out there, too. But watch your step, it’s probably pretty close to the Iggy Pop filter, and you won’t be able to get your graphics program back to comic book country after you’ve installed that one! Off the “Sticky Fingers” album. Back in the days when you got at least one 12×12 artwork for the money you spent for only one song. (Oh! Look! some of these others are prettydarn good too! Why don’t they play >them< on the radio too?) Sometimes, I get the feeling that yous guys think that folks like Warhol do what they do (or did) as easily as we walk from the parkinglot to the building. There is a self-referential struggle hidden in those soupcans and those real honest-to-god zippers on those album covers. Besides, Warhol didn’t do art. He did culture disguised as art. Ok. OK. So I didn’t walk with him. But I do have this picture of me and Duncan Reynaldo… And oh, yeah, try putting some brown sugar in your next expresso.